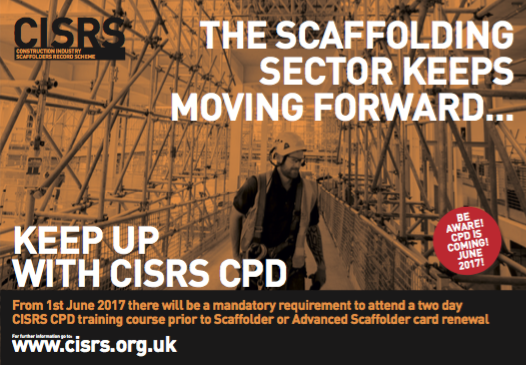 CISRS has announced that from 1 June 2017 it will introduce a two day Continuing Professional Development (CPD) course, which will become a mandatory requirement prior to Scaffolder or Advanced Scaffolder card renewal. CPD is an issue which has been discussed at length within the sector for over 10 years. Following correspondence with the HSE in 2015 urging CISRS to introduce CPD, as the scheme had been in existence for over 40 years without a formal route, it was agreed that the introduction of CPD would ensure that cardholders were kept up to date with the latest legislation and industry guidance. “We are aware that good employers strive to keep their workforce up to speed with changes within the industry, but this is not always the case. With a transient workforce and no formal programme for achieving this we cannot be sure exactly what information has been passed onto whom. “The basic principle of CPD and/or refresher training is a good one. However, we are all too aware that this comes at a cost not only for the training itself, but also loss of production etc. As such we are looking to ensure that the course provides the most gain for the least pain and offers the scaffolder and their employer some real value added training,” said Dave Mosley, CISRS Scheme Manager. CPD has been a regular agenda item at Access and Scaffolding Industry Training Organisation (ASITO) meetings, and a working party of CISRS representatives, scaffolding contractors and training providers was formed to take this forward. The working group began to put together a “wish list” of topics which they felt should be included within a CPD course aiming to focus on essential areas. SG4:15 – Inclusive of SG19 and harness training. TG20:13 – Inclusive of masonry anchors. 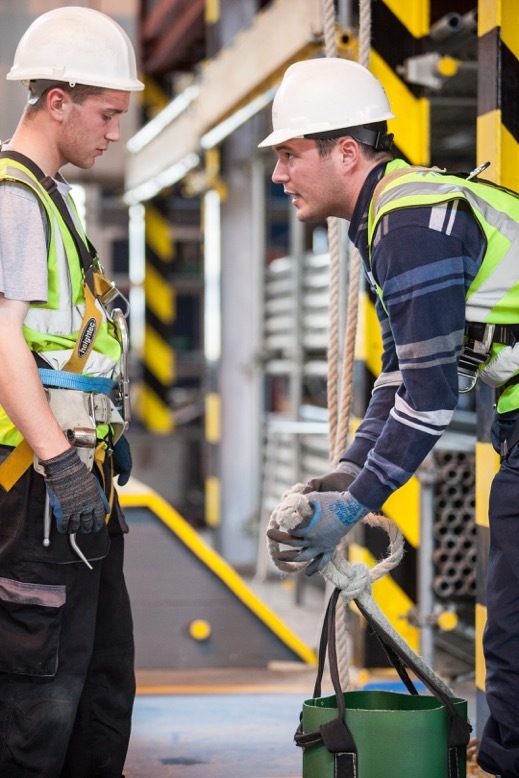 SG6 – Manual handling, inclusive of ropes and wheels and knots. Trends in accidents and reporting accidents. Communication – Inclusive of scaffolder responsibilities and behaviour. Edge protection and roof works. PPE – Responsibilities of employer. Incomplete scaffolds – Inclusive of signage and access. CISRS are also looking to include a Health & Safety test within the 2-day course which would then be accepted as a recognised exemption to the current Health and Safety and Environment Test (H&S&E). As such the scaffolder would not have to lose additional time undertaking the H&S&E test on another working day. The courses will be delivered by CISRS Accredited training providers. 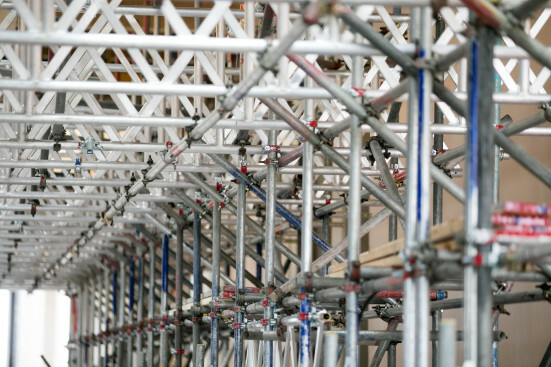 The majority of the course content will be the same for both Scaffolders and Advanced Scaffolders – with the main difference being the scaffold structures used for the practical inspection sessions. The NASC is launching a new biennial Scaffolding Product Innovation Award – celebrating the very best developments in new scaffolding materials and products from leading industry suppliers. The process for award submissions will be revealed in June, on the NASC website, across social media platforms and via e-shots. And the inaugural award will be presented at the confederation’s AGM in Amsterdam on November 25th (and thereafter every two years) – following an independent judging process, featuring a panel of leading access and scaffolding experts in the UK. Innovative entries will be accepted for any widely used scaffolding material, or access and scaffolding product from NASC member companies. The NASC has launched a ‘Qualifying the Workforce’ in-house programme offering member companies funding from a £30,000 central pot for up to 240 training placement payments. The NASC scheme has been introduced to reward members for their commitment to CISRS training and maintaining the high level of qualified staff required to retain NASC membership. NASC member companies will be able to apply for a payment of £125 for any of their employees who they have qualified to CISRS Scaffolder, Advanced Scaffolder or Scaffolding Supervisor, since 1st January 2016. Operatives will need to have completed all requisite training and be in possession of a current valid CISRS card for the grade for which they are applying in order to be eligible. In addition to the scaffolder training funds, there will also be a chance to claim for CISRS Operative Training Courses (COTS) training. Included within the 240 total placements, NASC will make up to a maximum of 50 payments of £125 to employers who have put their operative through the COTS course and have obtained a CISRS Labourer or CISRS New Entrant Trainee card via this process. QTW claims must be made online using the correct application form via the online members’ area of www.nasc.org.uk, under the training section (in the ‘Information’ menu). And applicants must include all relevant information for each candidate (correct individual details, card number etc). Only qualifications achieved after 1st January 2016 will be accepted. Applications will take up to four weeks to process.